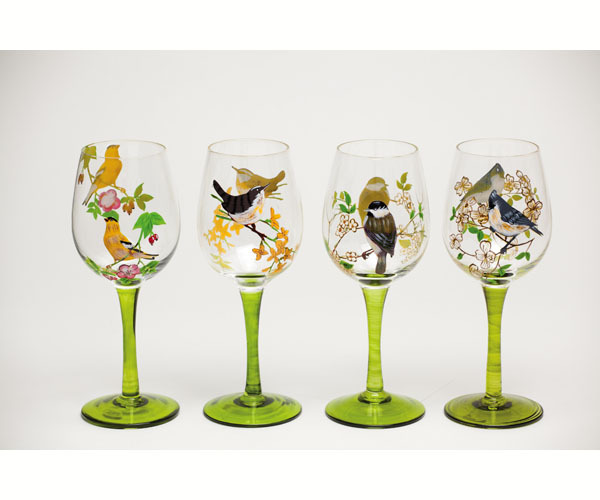 Lovely hand painted wine glasses adorned with various types of songbirds perched on blossom covered branches are perfect for serving wine at spring and summer gatherings! These beautiful glasses also make unique gifts! Dimensions: 3.9" Dia. 8.86" Tall ea. 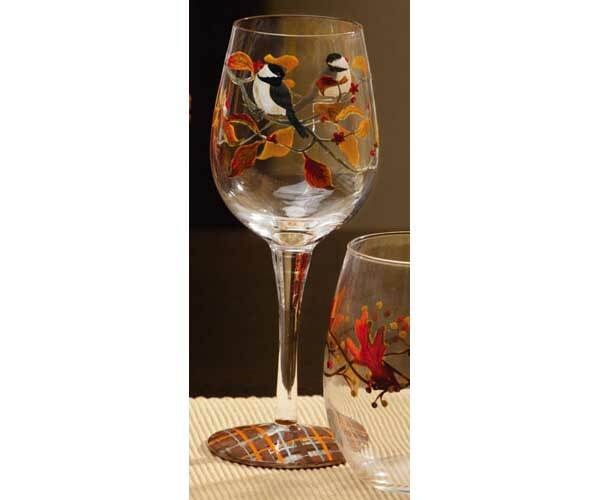 Featuring plump Chickadees resting on autumn leaf adorned branches, these beautifully hand painted wine glasses are perfect for serving wine at fall gatherings! Dimensions: 3.75" x 9" Tall ea. 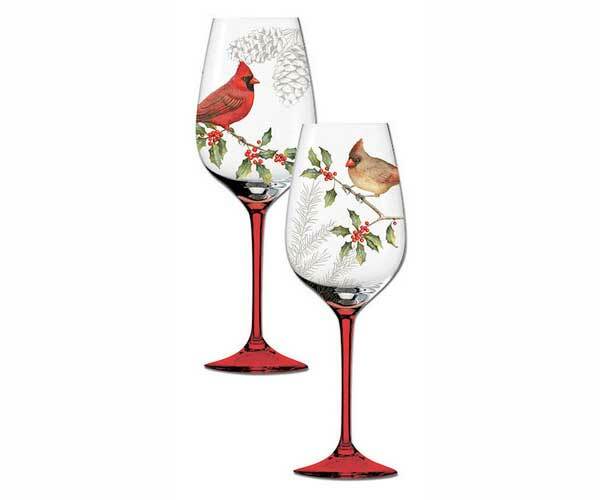 Artfully hand painted wine glasses depicting Cardinals perched on Holly branches with faint greenery and pine cones in the background. Set a festive, nature themed holiday table your guests will love! Dimensions: 3.75" x9" Tall ea. 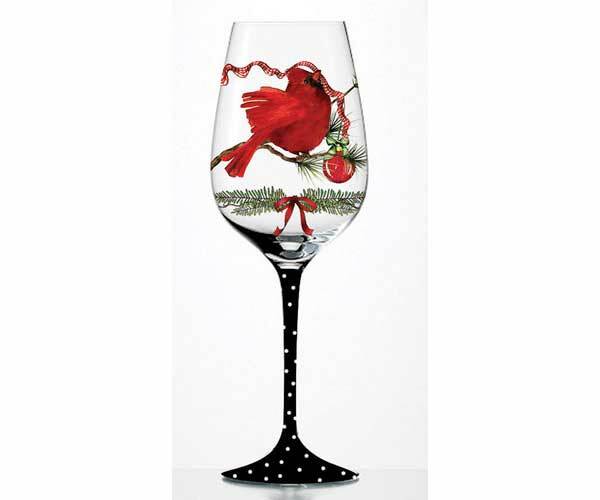 Dimensions: 7.8" x 0.9" x 7.8"
A beautiful addition to any holiday dinner table, each wine glass depicts a plump Cardinal with Christmas greenery and ornament accents! 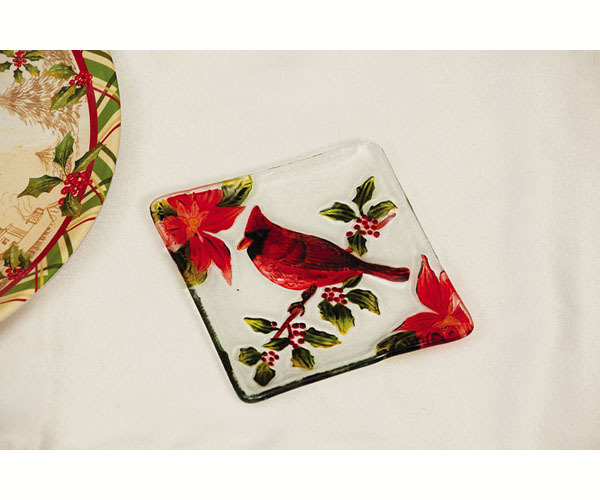 A beautiful addition to any holiday dinner table, this platter features a plump Cardinal with Christmas greenery and ornament accents! 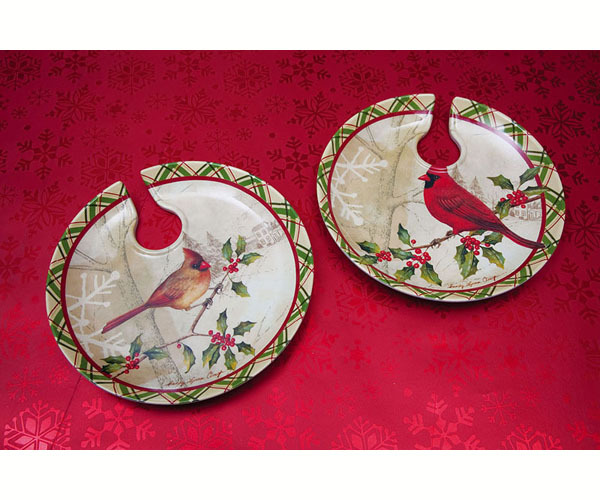 A beautiful addition to any holiday dinner table, these dessert dishes feature a plump Cardinal with Christmas greenery and ornament accents! 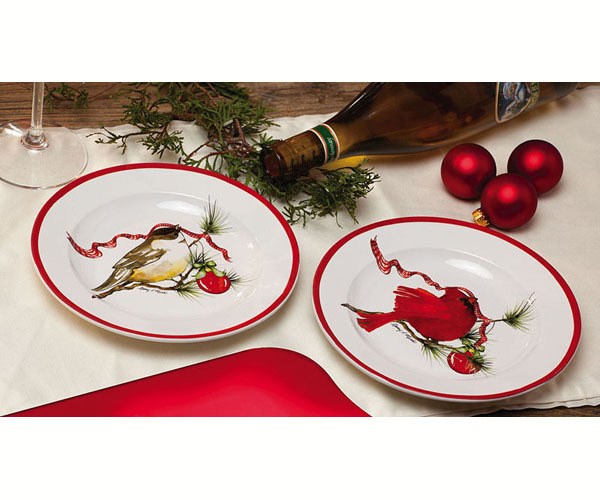 Serve up Christmas in style! 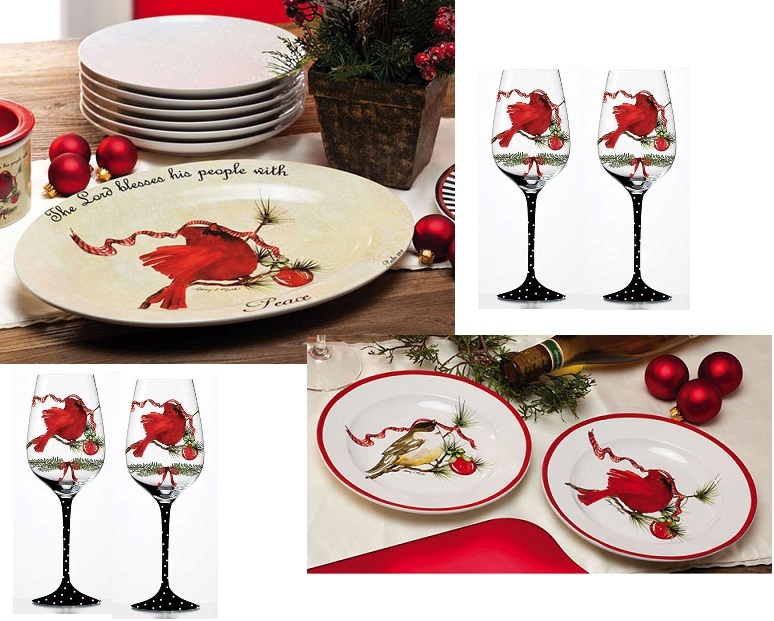 This adorable set includes a generous serving platter, 4 dessert plates and 4 wine glasses, each featuring a plump Cardinal with Christmas greenery and ornament accents! Serving Platter-1: 16" L x13" W x1.5"
Deep Dessert Dishes-4: 8" Dia. Wine Glasses-4: 3.75" x9" Tall ea. 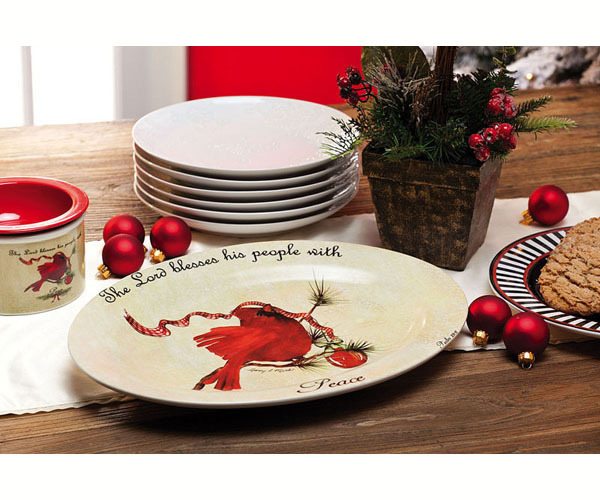 The perfect holiday dessert dish featuring a hand painted scene depicting a Cardinal with Holly and Poinsettias! 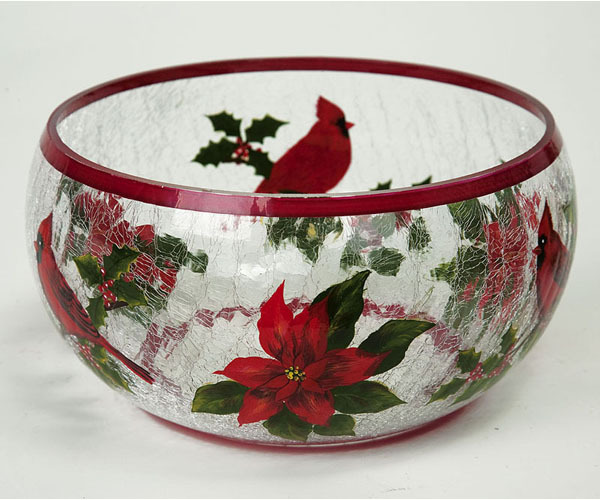 Dimensions: 5" x 5" x .75"
This beautiful serving bowl features handpainted Cardinals with Holly and Poinsettias! Dimensions: 10" Dia. x 5"